The page title should be shorter than 580 pixels. It is currently 1062 pixels long. The encoding specified in the HTTP-Equivalent meta element is not correct. The doctype HTML 4.01 Transitional is set correctly. description Die qualitativ besten deutschsprachigen Webseiten in einer Topliste nach Kategorien geordnet mit Bewertungs-, Kommentar- und Suchfunktion. 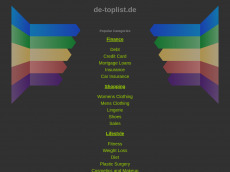 Test up to 1.000 webpages of de-toplist.de with our free plan! This page contains 713 words. That's ok.
27.8% of the text are stop words. The average number of words per sentence of 11.93 words is good. The amount of tags is very high (19). We recommend using a maximum of 14 tags for this page. 113 images have no alt attribute. The content of alt attributes is used by search engines. We have found 8 ads. The page may be crowded with ads. 16 links don't have an anchor text. There are 13 external links on this page. This website redirects to "https://de-toplist.de/"
This website loads 5 CSS files. This may affect the page load time negatively. This website has backlinks from 402 referring domains. This website has 40,639 backlinks. This website has backlinks from 129 different ip addresses.